Funny how so many software companies are having freebie give-aways these days to get attention - but it is not often an expensive 3D world/object creation tool is released for free. 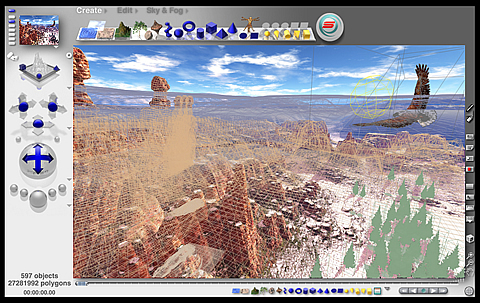 Bryce 3D is available for free download until September 6. This will be of interest to high school teachers looking for a way to extend students who have a taste for 3D design through use of Gamemaker and their own gameplay. I suggest Bryce because it is the interface is relatively simple and intuitive when compared to other 3D programs like Lightwave and 3D Studio Max. A number of content packages that offer pre-built models of things like scenery and people are available, including a free starter set in conjunction with this offer. Bryce works on both PC and Mac platforms. Getting free copies is relatively simple: download a copy from DAZ Production’s page. Then you will need to create an account or have students create them, then once you’re logged in, the registration link Bryce gives you will create your registration code.